My how things have changed. With this issue Julie Schwartz is continuing to do his level best to placate the irate Flashinados by bringing Atom artist Gil Kane over to handle the pencilling chores, Murphy Anderson and Vince Colletta to ink those pencils, and Neal Adams to pencil and ink the cover. It’s about as good a quartet of artists as you’re going to find, then or now, and, when you include writer Bob Kaniger, you’ve got the makings of a pretty special issue and then some. It was also a pretty special issue for a trio of Flash-Gram letter hacks, Irene Vartinoff, Mark Evanier, and Peter Sanderson who found themselves name-checked on the opening story’s splash page as the Flash signs autographs for fans after appearing at the Jerry Lewis Telethon. It was a natural event for DC to plug since they published the Jerry Lewis comic book (if you recall, it was original art from the Jerry Lewis comic that a certain editor there gave to me after my ill-fated visit there the previous summer – just checking to see if you’ve been paying attention). Kaniger’s story returns things to a smaller scope as he eschews aliens, ghosts and inter-dimensional beings in favor of the Flash being saved by a dog after some BGs blind the Flash in an attempt to help him transition from this life. 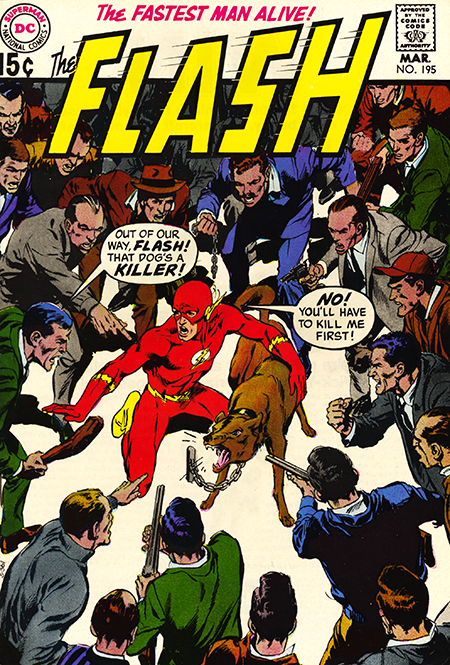 When the dog is accused of murdering his wealthy master and is about to be put down, the Flash intercedes to solve the mystery and collar (ha) the the real culprits behind the murder (same guys from earlier it turns out) and saves the dog from transitioning as well. Stories don’t come in a much scope than that. Wait… yes they do! In the issue’s second story (my, Julie certainly is trying to return to the tried and true), Mike Friedrich adeptly spins a tale about how Barry Allen overcomes his life-long fear of roller coasters in which the Flash only appears in a single panel. A very small story to be sure, but big in what it delivers. Both stories in this issue return things to a very human and relatable level which is one of the things that readers prized, and which always made this character so special.